Opening Song: My Hands Say Hello. We practice saying "Hello" with different body parts. I suggest a few and then ask children for their suggestions. Book: The Very Hungry Caterpillar (Pop-Up Book) by Eric Carle. 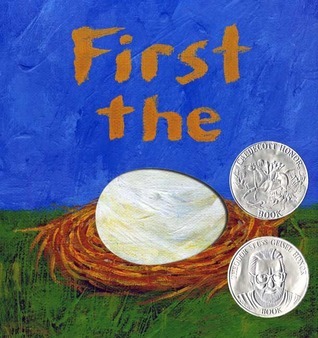 This book is a perennial favorite of children everywhere and many of the kids in this group were familiar with the story. When I share a familiar story, I always mention that it's one of my favorites and that's why I wanted to share it today. This encourages print motivation by demonstrating that I love this book enough to read it over and over again. We have the pop-up book in our programming collection and that adds a little something special because probably kids have not seen this version. Ten flowers in the spring. I had them stand up and we did actions to go along with the words. Fingerplays and action songs help develop fine and gross motor skills and they also help to get some of the "wiggles" out when kids have been sitting for awhile. 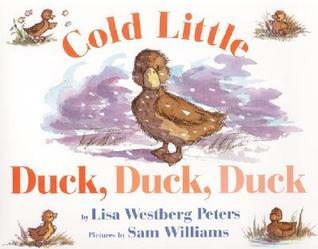 Book: Cold Little Duck, Duck, Duck by Lisa Peters, illustrated by Sam Williams. This book perfectly describes what I'm feeling about spring this year. Little Duck is so ready for spring, but her pond is still iced over, so she dreams about spring until it arrives. Repeating words on each page give this book a nice rhythm and it uses lots of sound words, which encourage children to play with words and sounds (helping them learn that words are made up of smaller sounds). I think I read this one a little too slowly starting out and the kids started getting a little squirrelly. If I did it again, I'd read it a little faster, empahsizing the rhythm of the words. Song: Five Little Ducks with stick puppets. I like to do this song with duck stick puppets and leave one behind my back each time fewer ducks come swimming back. At the end, I ask the kids to help Mother Duck call for her babies and we QUACK QUACK QUACK QUACK louder and louder until I bring back all the duck puppets! 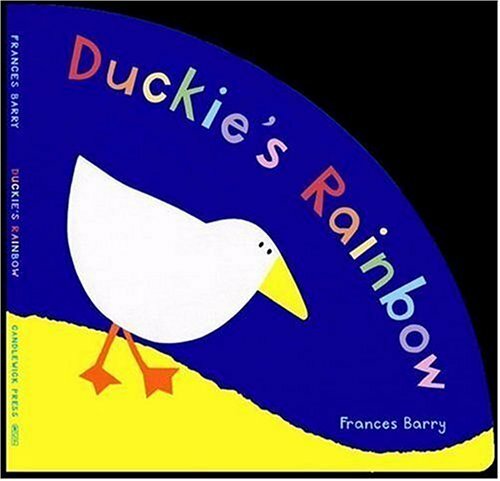 Mama duck said, "Quack, quack, quack, quack,"
Book: Duckie's Rainbow by Frances Barry. This simple story is great for practicing colors as Duckie makes her way home before a rainstorm. Song: If You're Wearing Red Today. I wanted one more action song and this went nicely with the color theme of our last book. I asked the kids to notice what colors they're wearing and then to be good listeners because this song was going to mention a color they might be wearing and ask them to do something. I switch up the color and the action (clap your hands, touch your nose, pat your knees, stick our your tongue, rub your tummy, etc.) each time. This song is great for encouraging listening skills. Mystery Bag: We've incorporated the Mystery Bag in order to reinforce letter knowledge. Today's letter was "S" for spring! I asked the kids what sound it makes and if they could think of any words that started with "S" (sun, snake, their teacher Miss Starr). Then I brought out the objects from the bag and we talked briefly about each one. In my bag I had a stick (a rain stick! ), a square shape, a seashell, and a scarf. Closing Song: Do You Know What Time It Is? Using opening and closing songs help signal to children when storytime is beginning (and they know it's time to listen) and when storytime is ending (and they know it's time to move on to something else).